View Poll Results: Where did you buy your most recent folding bike? I was looking at various posts on how so many bikes nowadays are bought from Amazon and many big brands now have a direct selling business on Amazon too who had held out for many years but then realised they were missing out on huge sales. I just checked amazon's best sellers for folding bikes both UK and US. Both seem to be mainly cheap folding bikes with the UK dominated by a company called Ecosmo which looks to be a Chinese brand that has setup a distribution centre in Birmingham in the UK. None of their bikes look particularly great in components but get good reviews. US has Euromini bikes in the top 2 slots and then its a mixed bag of brands too. This will vary I'm sure day by day but that is the current situation. So just for the novelty I'd thought I'd a poll on where we are buying our bikes. If you have more than one bike please vote for the most recent purchase rather than your main bike. As the poll is for indicating our most recent spending patterns ideally. LBS. And the one before that, and the one before that. Unless you are your own mechanic, the only place you should ever purchase your bike from. Now, where is the poll? Last two folders were: Used from Craigslist, new from ThorUSA.com. all second hand. i think the last one from a pawn shop. two from pawn shops, two from thrift stores, one from a flea market. wouldn't mind finding one or two more fuji/marboro folders. I ordered mine straight from Helix in Toronto, Canuckistan. Last edited by Revoltingest; 03-30-18 at 09:07 AM. Direct from the manufacturer (Bike Friday). I have no preference since I usually strip down and mod my bikes. I usually buy from an LBS since I prefer to test ride, but I've also bought from Ebay, Craigslist, Aliexpress, and Amazon. but then, after calling them up, the company pulled it off, and we sorted it out between us.. they saved the fee %. Last edited by fietsbob; 03-30-18 at 10:12 AM. Great to see the local bike shops still have a strong showing but I'm a bit surprised the direct seller's are in the lead. I guess the Amazon bikes are more casual or impulse buy's and their buyers are less likely to be looking at bike forums. I've never actually bought a bike from a direct seller myself despite having quite a few bikes. Nearest I've got is a bicycles4u Paris Explorer but I bought it s/hand through ebay. Same here. Dahon Curve from Craigslist and a Crius Smart from ThorUSA. The masses don't know any better. So price is all that they consider. Voted for LBS, as no suitable option, but actually direct from main UK distributor because they were closer and had stock that I could try. 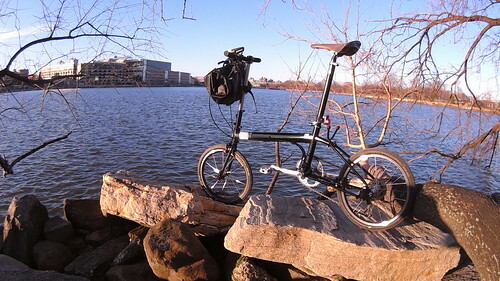 Bought my Brompton M6L-X from Bikes & Life. I wasn't sure what to call them so I voted Bike Shop chain, and it was online. It was a 2016 demo model that I got for an unbeatable price. Third, fourth, fifth bikes: Craigslist. The funny thing is bikes four and five were from Craigslist sellers who both used to own LBS. Both told me that they could no longer afford the lease, so they closed their doors and run it out of their houses as mobile services. I gathered from both that they were doing significantly better financially. Meanwhile a third LBS closed a couple of months ago.... I’m in the Vancouver, B.C. area.